You may call Tahia Karioka whatever you like — describe her any way you can. You can consider her controversial, daring, and maybe too confrontational. However, you can’t deny one truth, which is that Tahia Karioka is among the most important figures in Egyptian cinema history. Born in Ismailia, most likely on 22 February 1915 for there was no definite date of her birth, and she preferred to not say, Carioca spent over six decades in the world of acting and Oriental dancing, and passed away 20 September 1999. To add to the mystery surrounding her, it is believed that her real name was Badawiyya, as she said in one radio interview, adding that it was Badawiyya that was used during her miserable childhood. Yes, Tahia Karioka lived a miserable childhood where she suffered all kinds of physical abuse at the hands of her eldest brother, to the extent of shaving her head and preventing her from going out. Reaching 13 years, she couldn’t endure it any more. She decided to go to Cairo to connect with a songstress, Soad Mahsen, who was one of her brothers’ acquaintances. Mahsen gave Tahia a warm welcome then made her an extra in one of the plays she was involved with, holding a spear on the advice of actor Bishara Wakim. Gradually, Tahia began to practice her hobby of dancing. Soon she joined Badia Masabni’s company, the most famous entertainment artist at the time. The pioneer director Togo Mizrahi was the first to take note of her and cast her in Dr Faraht (1935), and then in The Gendarmerie Sentry (1936). In 1937, she appeared in Behind the Curtains directed by Kamal Selim. Thus, Tahia became a familiar face as an Oriental dancer to the extent that she participated in seven films until 1942, most of which were directed by Togo Mizrahi. However, Tahia worried about being treated as only a belly dancer. She viewed herself as a talented female cinema star, especially following her success in the part that Togo Mizrahi gave her in Leila, the Girl from the Countryside (1941). She decided to produce films in order to be an acknowledged actress. Tahia launched, along with the actor Hussein Sedky and director Hussein Fawzi, a production company they called Youth Films. They produced for free while working on the company's debut, I Like Doing Wrong Things (1942), which marked Tahia’s first leading role. Despite this film’s success, which was followed with other films, Tahia still needed a spectacular success proving her talent. That was achieved in The Concealment Cap (1944), directed by Niazi Mostafa. With the end of World War II, musical comedies began to rise in the hands of Hussein Fawzi, Ahmed Badrakhan and Helmy Rafla. Tahia Karioka was capable of constantly finding a place for herself in the commercial formula of this kind of film, like her competitors Samia Gamal and Naima Akef. Both of them confined their work to one person: Samia Gamal was almost always present with Farid Al-Atrash, while Naima Akef appeared in the films of her husband director, Hussein Fawzi. Tahia distinguished herself from these competitors by collaborating with everyone, whether actors, producers or directors. 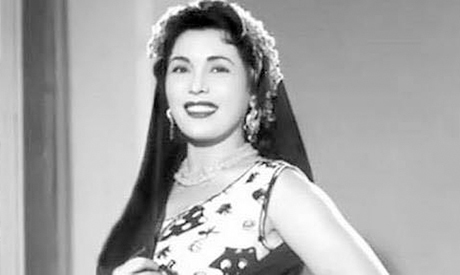 Tahia regularly appeared in films featuring known singers, such as Mohamed Fawzi, Karem Mahmoud, Al-Kahlawi, Abdel-Aziz Mahmoud and also Farid Al-Atrash. Tahia also worked with the most prominent comedy stars, starting with Naguib Al-Rihani in The Lady's Game (1946) directed by Wali Eldin Sameh, then Ismail Yassin, the 1950s comedy superstar, in The Hero (1950) and My Mother-in-Law is an Atomic Bomb (1951) directed by Helmy Rafla, and Her Ladyship (1956) directed by Hassan El-Seify. Tahia didn’t mind playing good supporting roles alongside leading roles. She did that with Leila Mourad in Love Beach (1950) directed by Henri Barakat, with Aziza Amir in Kismet (1950) by Mahmoud Zulfikar, with Faten Hamama in A Good Fellow (1951) by Seif El-Din Shawkat, and with Magda in Beach of Secrets (1958) by Atef Salem. As viewers continued to admire Tahia as an actress, the question we can ask is why did she stop her dancing career, even though this was the skill that made her enter the cinema world in the first place? Unlike many other dancers, like her mentor Badia Masabni who was around 40 when she succeeded in cinema, or Nabawiyya who was also older, Tahia was not even 20 years old when she first appeared on screens. She had time to assert her presence and shape her creative future, unlike other belly dancers of that period whose cinematic experiences were incomplete, except Samia Gamal and Naima Akef. In parallel, Tahia didn’t burden herself with marginal matters that would lessen her focus on cinema. She didn’t have a company, like Badia Masabni or Marie Mansour, nor did she enter politics, unlike Hekmat Fahmy. And she didn’t engage in disputes with her competitors, like what happened between Beba Ezz-eddin and Badia Masabni. It is true that Tahia went through a number of failed marriages, including her marriage to an American army officer who took her with him to the US, a fact that stalled her cinematic career in 1947, but she aimed at Hollywood and working there. Appearing in 22 films until 1946 was enough to fix Tahia's image in viewers’ minds. For when she returned to Egypt, after divorcing, she participated in six films in succession, and then 28 in the next four years. Another stoppage in Tahia career occurred because of her marriage to Mostafa Kamal Sidqy, the Iron Guard commander before the July Revolution. Both were charged, among others, with plotting to overthrow the regime and imprisoned in 1954. When Tahia was jailed, she had 62 films under her belt and starred in distinguished films such as The Lady’s Game with Al-Rihani, I Can’t (1946) with Farid Al-Atrash, Love and Madness (1948) with Mohamed Fawzi and My Mother-in-Law is an Atomic Bomb with Ismail Yassin. In the following years she also acted in the masterpieces A Woman’s Youth directed by Salah Abu-Seif and Samara by Hassan El-Seify (both in 1956). Thus, she swiftly regained what she had lost in prison. Tahia always kept a good standing among the audience, part of which was the fact that she didn’t dance in known nightclubs, unlike Horeya Mohamed, Beba Ezz-eddin and Hekmet Fahmy. Most of Tahia's dancing numbers were performed during local or international tours. She wasn’t also keen to acquire the title of the prince’s dancer, or the palace dancer, like Thuraya Salem. Even her ambiguous relationship with King Farouk was on a surprisingly equal footing. All the aforementioned helped in making members of the middle and low classes accept her as an actress. This was an advantage that no belly dancer enjoyed, except Samia Gamal and Naima Akef. Moreover, Tahia had a natural talent for acting. This talent enabled her to continue a cinematic career after stopping dancing, while her peers couldn’t carry on acting. Tahia was intelligent enough to keep pace with developments in public taste. Starting as one of the stars of musical comedies, which prevailed during the 1940s and early 1950s, she moved to social dramas, in which she featured prominently, to family comedies in the 1960s in which she benefitted from ageing gracefully while reserving a place for herself on screen. If the credit for Tahia's cinematic debut goes to Togo Mizrahi and if Helmy Rafla was the director who cast her most – in 14 films – her most distinctive classics are with other directors. These directors are Salah Abu-Seif in A Woman’s Youth and The Strong Man (1957); Atef Salem in We are the Students (1959) Mother of the Bride (1963) and Khan Al-Khalili (1966); Waly El-Din Sameh in The Lady’s Game; Andrew Marton in Oh My Islam (1961); Hassan El-Seify in Samara; and Anwar El-Shennawy in The Mirage (1970). With the exception of The Lady’s Game, Tahia didn’t play the role of the belly dancer/actress in these films. She relied only on her acting abilities to the extent that she succeeded in making viewers forget the time of her retirement from dancing. This unlike Samia Gamal, who once she retired from dancing likewise stopped acting, and also unlike Naima Akef, who when her health prevented her from dancing confined herself to supporting roles. This advantage helped her to challenge time artistically, transforming herself from a young girl to a mature woman, to a mother who knows what is going around her, starting with her memorable role in Mother of the Bride. At that stage, Tahia's roles began to acquire an obvious human dimension, even when she was playing the role of a prostitute in The Road (1964) directed by Hossam El-Din Mostafa, Khan El-Khalili by Atef Salem and The Mirage by Anwar El-Shennawy. Starting with the 1970s, Tahia exerted efforts to portray the role of the mother differently in every film. This was evident in Take Care of Zouzou (1972) directed by Hassan Al-Imam and in Al-Karnak (1975) by Ali Badrakhan. She played mother of Soad Hosni in both films, but the difference was monumental. What’s noticeable in all Tahia's roles is that they are strong characters. She didn’t like the role of the weak woman. She was always the one who takes the initiative and has a clear influence on events. However, this strong character didn’t prevent her from showing her charms and femininity, in A Woman’s Youth and Samara. When wrinkles began to appear on her fascinating face, the wisdom of time replaced the charms and attractiveness, such as in Take Care of Zouzou and Oh My Country (1986) directed by Hussein Kamal.